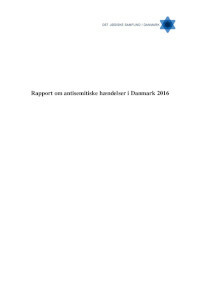 Denne rapport beskriver og analyserer antallet af registrerede antisemitiske hændelser i Danmark i 2016. Rapporten er udarbejdet på grundlag af anmeldelser til AKVAH, der udgør en del af Det Jødiske Samfunds sikkerhedsorganisation. This report describes and analyzes the number of registered anti-Semitic events in Denmark in 2016. The report is based on reports to AKVAH, which forms part of the Jewish Society's security organization. AKVAH has registered 22 antisemitic events in Denmark in 2016 in the following categories: Attempts at killing, threats, anti-Semitic utterances, vandalism and other harassment. The events are divided into one case of attempted killing, two cases of threats, 17 cases of antisemitic utterances, a case of vandalism and a case of other harassment. Out of the 22 registered anti-Semitic events, there are three events where it is considered that they can be termed as potentially antisemitic. The 22 registered anti-Semitic events in 2016 are four events fewer than the number of recorded events in 2015, which was 26. The only increase in the number of recorded events has occurred in the category of anti-Semitic expressions. By 2015, AKVAH registered 11 cases of anti-Semitic expressions, which was the largest event group in that year. This number rose in 2016 to 17 registered cases. The category is still the largest event group. The number of threats, the number of cases of aggression and physical harassment as well as the number of vandalism incidents have fallen. By 2015, seven cases of threats were registered, while two cases were registered in 2016. Similarly, four cases of cases of abuse and physical harassment were registered in 2015, whereas no such cases have been registered in 2016. There has also been a decrease in the number of vandalism episodes. In 2016, a case of vandalism was recorded, a decrease of two cases compared to 2015. In both 2015 and 2016, one case of the category of killing and killing has been recorded. Generally speaking, there is a total decrease in the number of "coarser" anti-Semitic events from 2015 to 2016.